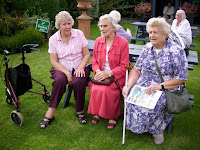 For September's Club's garden visit we took a trip to south Devon. Firstly stopping at Endsleigh Garden Centre for coffee, browsing and shopping we arrived at Saltram House in glorious autumnal sunshine. A beautiful day was spent admiring the cyclamen in Lime Walk and the splendor of the parkland surrounding a grand house. The Autumn Flower Show was a great success thanks to members exhibiting flowers and foliage after a very difficult summer for gardeners. A wealth of visitors and members enjoyed the colourful array of entries in all sections. In the Decorative Section the principal prizewinners were Ann Steer, Christine Moore, Tim Nichols and Stephanie Sporne. Christine Moore won the Award of Merit for her ‘An arrangement using orange flowers’. Stephanie Sporne won the special award for the novice class ‘An arrangement in a glass container’. The winners in the Childrens’ Sections were Paige Nichols and Jessica Ridgeway. In the Cut Flowers Section the principal prizewinners were Sue Gollop, Alby Berry, Ann Crawford, Peter Billing, Margaret Grose and Rachael Hart, with Alby Berry winning the Award of Merit for a vase of three decorative dahlias. In the Shrubs and Trees Section the principal prizewinners were Alby Berry, Jean Bennett and Ann Crawford with Alby Berry winning the Award of Merit for a vase of mixed flowering shrubs. In the Pot Plant Section the principal prize-winners were Norah Mears, Peter Billing, Margaret Grose, Sue Gollop, Jean Bennett and Chad Stone with Chad Stone winning the Award of Merit for a beautiful tuberous begonia called Power Puff. The Members Competition for a Gerarium, provided by the Club, was won by Peter Billing. In the Photography Section the principal prizewinners were Sylvia Frost, Bob Frost and John Bennett with Sylvia Frost, winning the Award of Merit with her photo of ‘A Sky’. 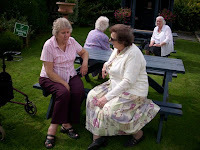 A new class in memory of coach driver Colin Upham was to enter a photo from a Club event and this was won by Mrs Jean Webb who had taken a photo on a garden club visit. Finally, the Jubilee Class was won by Tim Nichols with 25 points for a collection including a flower arrangement, a vase of mixed variegated shrubs and a photograph. A close second was Alby Berry with 24 points. Here are a few photos from today's Autumn Flower Show held at the New Hall. Monica happy that the day is over! Our first meeting of the Autumn season saw Phillip Kerton and his wife Joyce from Bridgwater visit the club to talk with a passion about sweet peas. He gave a good crowd of members a history of how he started to grow sweet peas to show and then start his specialist nursery. He explained how he growed and cared for them and then arranged them at the various Flower Shows throughout the season including Chelsea. After his talk he answered members questions about soil content and storing of seeds and other growing tips. 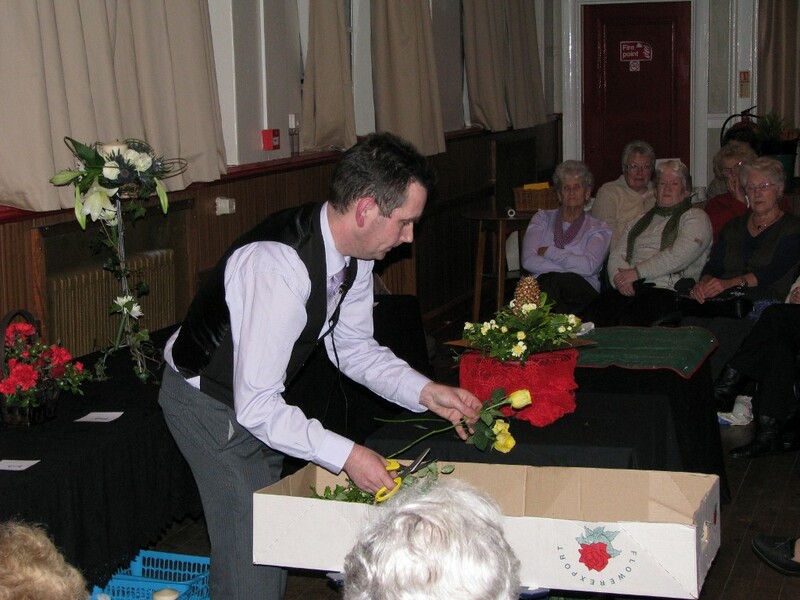 Philip Kerton from Bridgewater will visit the Club on Tusday 1st September to discuss how to grow Sweet Peas. We meet at 7.30pm at the Memorial Hall, Angel Hill. The Autumn Flower Show takes place on Saturday 5th September at The New Hall, Barrington Street. Entry forms should be with the Show Secretary by Wednesday 2nd September. 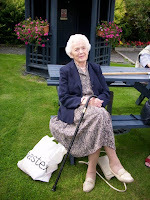 Here are just a few photos taken at the Anniversary lunch in Barnstaple taken by Ros Nichols & Val Payne. The lunch was in celebration of 10 years of successful holidays organised by the present sub committee.